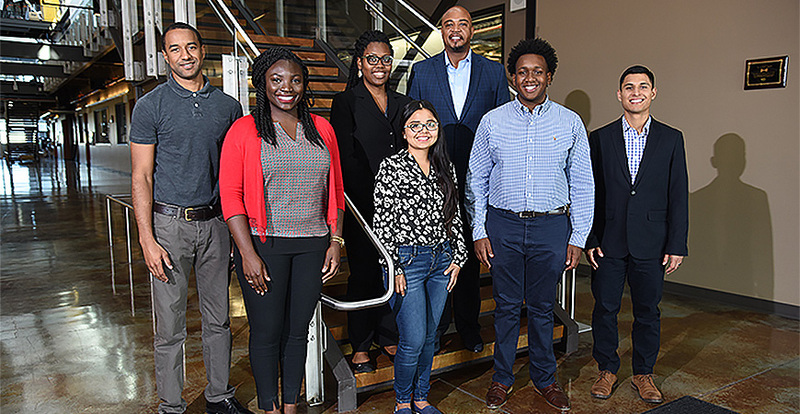 Six graduate students landed spots at Idaho National Laboratory through the National GEM Consortium, including UC Merced's Jordan Galloway (left). Photo courtesy of Idaho National Laboratory. As a graduate student at UC Merced, Jordan Galloway looks for ways to push himself forward and lead by example. The third-year Chemistry and Chemical Biology student forged a new path last summer through a fellowship in the nuclear science and technology division of Idaho National Laboratory. He was one of six paid interns — and the only UC Merced student — who landed spots at the lab through the National GEM Consortium. The consortium and its partners work to expand diversity and increase the participation of underrepresented groups at the master's and doctoral levels in engineering and science. UC Merced has been a member of the consortium since 2015. After a series of qualifying rounds, Galloway’s application was selected and placed in a pool available to potential employers — industry partners in the public and private sectors. He caught the eye of Terrence Buck, senior inclusion and diversity consultant at the lab, which is regarded as the nation’s lead center for advanced nuclear energy research, development, demonstration and deployment. Terrence Buck welcomes INL’s first GEM Fellows. Photo courtesy of Idaho National Laboratory. Galloway was in the first cohort of GEM fellows to work at Idaho National Laboratory. He described Galloway as a standout even though the research focus was a bit out of his element. “He was able to take a project outside of his comfort zone and really excel at it,” Buck said. At the lab, Galloway worked in a diverse team of engineers and interns to develop a roadmap towards the manufacturing and deployment of micro-scale nuclear reactors. In part, such micro-reactors could be more practical, more environmentally friendly and cheaper than traditional, fuel-dependent generators. Galloway looked at the structural materials that might be used in those reactors. “A lot of it was unfamiliar territory where I had to kind of rise to the occasion,” he said. These students are super-smart. This gives them tremendous exposure to one of the national labs and an opportunity to come here and shine. That valuable experience helped him refine the skill of processing technical data and feel comfortable in leaping into research beyond his emphasis in organic chemistry. The GEM fellowship also added to a resume that already includes internships with NASA Langley Research Center and the Air Force Research Laboratory: Information Directorate. Originally from Los Angeles, Galloway completed his undergraduate studies in chemistry at Shaw University in North Carolina. 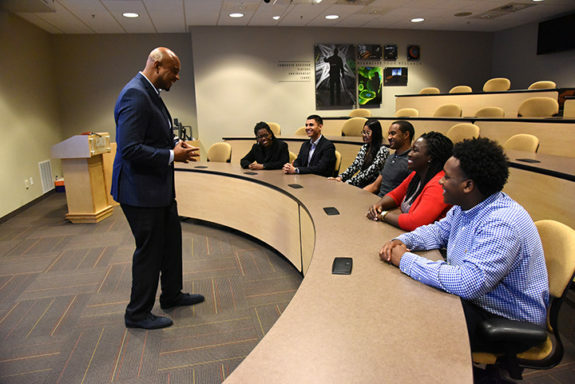 Finding avenues for growth and lifting up others — especially underrepresented minorities — are important aspects of Galloway’s educational and life plan. At UC Merced, he has worked on several levels to mentor students and encourages them to pursue advanced degrees in chemistry and the sciences. “If you can be an active part in someone’s life through outreach or mentorship, you should do that,” Galloway believes. He chose to pursue his doctorate at UC Merced because he wanted to return to California, study within the UC system and work with Professor Ryan Baxter’s organic chemistry research group. Now in his third year at UC Merced and with Baxter’s lab, Galloway’s research involves developing practical and novel methods and strategies to perform chemical transformations. Galloway also recently received a National Science Foundation Graduate Research Fellowship, which is the first for the Chemistry and Chemical Biology graduate group. Baxter described Galloway as motivated and a self-starter who isn’t afraid to pursue the answers to tough questions. “He has a curiosity that really fuels his effort in the lab,” Baxter said. Galloway, whose twin brother is pursuing a doctorate in economics at Howard University, plans to complete his Ph.D. in the next few years and pursue a postdoctoral position at a National Laboratory. In the meantime, he’s enjoying his work and time at UC Merced. “It’s one of the best universities I’ve ever been to,” he said.